At six foot five and 240 plus pounds, Jerry Janes was the kind of big target that quarterbacks like to throw to. Janes was an End out of Louisiana State where he was drafted i nthe 21st round of the 1957 NFL draft by the Chicago Bears. 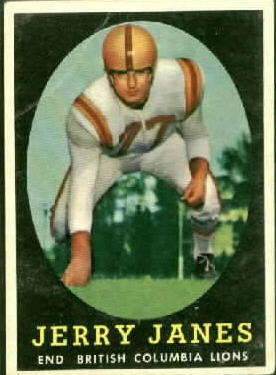 Janes came instead to the CFL and the BCF Lionswhere he would play three seasons from 1957 to 1959. Janes put up some very respectable numbers in an era where tight ends were not often the primary receiver. Janes had 47 catches for 828 yards in 1958 and 41 catches for 936 yards in 1959. Janes had very good yards per catch averages in his three years with the Lions, twice averaging more than 20 yards per catch. The Lions actually tried to trade Janes to Ottawa prior to the 1959 season, but took cash instead when Janes refused to go to Ottawa due to involvement in business in BC. Janes was traded for a second time by BC prior t othe 1960 season, this time to Montreal. Janes went to the Als, bu the deal was contingent on Janes making the team and Montreal elected to return Janes to the Lions. BC then promptly arranged another trade for Janes, sending him to Calgary where he only played one game for the Stampeders in 1960 before being traded yet again. This time Janes ended up in Hamilton in exchange for import Ernie Danjean. Janes played just one game for Hamilton in 1960 before being released. Janes didn't play in 1961, and then in 1962 and now a Canadian citizen, Janes was back in camp with the Lions. Janes didn't play any games for the Lions in 1962 and played 17 games in 1963. Yes it was a 16 game schedule, but Janes played one game for Hamilton and then 16 with BC. The Lions went to the Grey Cup that year (1963), losing to the same Hamilton Tiger-Cats he was traded from.